Hellenization or Hellenisation is the historical spread of ancient Greek culture, religion and, to a lesser extent, language, over foreign peoples conquered by Greeks or brought into their sphere of influence, particularly during the Hellenistic period following the campaigns of Alexander the Great in the fourth century BC. The result of Hellenization was that elements of Greek origin combined in various forms and degrees with local elements; these Greek influences spread from the Mediterranean basin as far east as modern-day Pakistan. In modern times, Hellenization has been associated with the adoption of modern Greek culture and the ethnic and cultural homogenization of Greece. The first known use of verb "to Hellenize" (ἑλληνίζειν) is by Thucydides, who wrote that the Amphilochian Argives were linguistically Hellenized by the Ambraciots. It is also used in 2 Maccabees and the Book of Acts The precise meaning is disputed but scholars believe the meaning of the word was not limited to "Greek-speaking". Map of the Hellenized Macedonian Empire, established by the military conquests of Alexander the Great in 334–323 BC. By the 4th century BC the process of Hellenization had started in southwestern Anatolia's Lycia, Caria and Pisidia regions. (1st century fortifications at Pelum in Galatia, on Baş Dağ in Lycaonia and at Isaura are the only known Hellenistic-style structures in central and eastern Anatolia). When it was advantageous to do so, places like Side and Aspendos invented Greek-themed origin myths; an inscription published in SEG shows that in the 4th century BC Aspendos claimed ties to Argos, similar to Nikokreon of Cyprus who also claimed Argive lineage. (Argos was home to the Kings of Macedon.) Like the Argeads, the Antigonids claimed descent from Heracles, the Seleucids from Apollo, and the Ptolemies from Dionysus. The Seuthopolis inscription was very influential in the modern study of Thrace. The inscription mentions Dionysus, Apollo and some Samothracian gods. Scholars have interpreted the inscription as evidence of Hellenization in inland Thrace during the early Hellenisitc, but this has been challenged by recent scholarship. Hellenization, however, had its limitations. For example, areas of southern Syria that were affected by Greek culture entailed mostly Seleucid urban centres, where Greek was commonly spoken. The countryside, on the other hand, was largely unaffected, with most of its inhabitants speaking Syriac and clinging to their native traditions. Archaeological evidence alone gives only an incomplete picture of Hellenization; it is often not possible to state with certainty whether particular archaeological findings belonged to Greeks, Hellenized indigenous peoples, indigenous people who simply owned Greek-style objects or some combination of these groups. Thus, literary sources are also used to help researchers interpret archaeological findings. In 1909, a commission appointed by the Greek government reported that a third of the villages of Greece should have their names changed, often because of their non-Greek origin. In other instances, names were changed from a contemporary name of Greek origin to the ancient Greek name. Some village names were formed from a Greek root word with a foreign suffix or vice versa. Most of the name changes took place in areas populated by ethnic Greeks in which a strata of foreign or divergent toponyms had accumulated over the centuries. However, in some parts of northern Greece, the population was not Greek-speaking, and many of the former toponyms had reflected the diverse ethnic and linguistic origins of their inhabitants. In 1870, the Greek government abolished all Italian schools in the Ionian islands, which had been annexed to Greece six years earlier. That led to the diminution of the community of Corfiot Italians, which had lived in Corfu since the Middle Ages; by the 1940s, there were only 400 Corfiot Italians left. Hellenization reached Pisidia and Lycia sometime in the 4th century BC, but the interior remained largely unaffected for several more centuries until it came under Roman rule in the 1st century BC. Ionian, Aeolian and Doric settlers along Anatolia's Western coast seemed to have remained culturally Greek and some of their city-states date back to the Archaic Period. On the other hand, Greeks who settled in the southwestern region of Pisidia and Pamphylia seem to have been assimilated by the local culture. Panticapaeum (modern day Kerch) was one of the early Greek colonies in Crimea. It was founded by Miletus around 600 BC on a site with good terrain for a defensive acropolis. By the time the Cimmerian colonies had organized into the Bosporan Kingdom around much of the local native population had been Hellenized. Most scholars date the establishment of the kingdom to 480 BC, when the Archaeanactid dynasty assumed control of Panticapaeum, but classical archaeologist Gocha R. Tsetskhladze has dated the kingdom's founding to 436 BC, when the Spartocid dynasty replaced the ruling Archaeanactids. The Hellenistic Seleucid and Ptolemaic kingdoms that formed after Alexander's death were particularly relevant to the history of Judaism. Located between the two kingdoms, Israel experienced long periods of warfare and instability. Judea fell under Seleucid control in 198 BC. By the time Antiochus IV Epiphanes became king of Judea in 175 BC, Jerusalem was already somewhat Hellenized. In 170 BC, both claimants to the High Priesthood, Jason and Menelaus, bore Greek names. Jason had established institutions of Greek education and in later years Jewish culture started to be suppressed including forbidding circumcision and observance of the Sabbath. Hellenization of members of the Jewish elite included names, clothes but other customs were adapted by the rabbis and elements that violated the halakha and midrash were prohibited. One example is the elimination of some aspects of Hellenistic banquets such as the practice of offering libations to the gods, while incorporating certain elements that gave the meals a more Jewish character. Discussion of Scripture, the singing of sacred songs and attendance of students of the Torah was encouraged. One detailed account of Jewish-style Hellenistic banquets comes from Ben Sira. There is literary evidence from Philo about the extravagance of Alexandrian Jewish banquets and The Letter of Aristeas discusses Jews dining with non-Jews as an opportunity to share Jewish wisdom. Head of a statue of a Parthian wearing a Hellenistic helmet from Nisa. The Parthians adopted both Achaemenid and Hellenistic cultures. Pamphylia is a plain located between the highlands of Lycia and Cilicia. The exact date of Greek settlement in the region is not known; one possible theory is that settlers arrived in the region as part of Bronze Age maritime trade between the Aegean, Levant and Cyprus, while another attributes it to population movements during the instability of the Bronze Age Collapse. The Greek dialect established in Pamphylia by the Classical period was related to Arcado-Cypriot. Mopsus is a legendary founder of several coastal cities in southwestern Anatolia, including Aspendos, Phaselis, Perge and Sillyon. A bilingual Phoenician and neo-Hittite Luwian inscription found at Karatepe, dated to 800 BC, says that the ruling dynasty there traced their origins to Mopsus. Mopsus, whose name is also attested to in Hittite documents, may originally have been an Anatolian figure that became part of the cultural traditions of Pamphylia's early Greek settlers. Attested to in Linear B texts, he is given a Greek genealogy as a descendent of Manto and Apollo. For centuries the indigenous population exerted considerable influence on Greek settlers, but after the 4th century BC this population quickly started to become Hellenized. Very little is known about Pisidia prior to the 3rd century, but there is quite a bit of archeological evidence that dates to the Hellenistic period. Literary evidence, however, including inscriptions and coins are limited. During the 3rd and 2nd centuries, native regional tongues were abandoned in favor of koine Greek and settlements began to take on characteristics of Greek polis. The Iron Age Panemoteichos I may be an early precursor to later regional Hellenistic settlements including Selge, Termessos and Sagalssos (believed to be the three most prominent cities of Hellenistic Pisidia). The site is evidence of "urban organization" that predates the Greek polis by 500 years. Based on Panemoteichos I and other Iron Age sites, including the Phrygian Midas şehri and the Cappadocian fortification of Kerkenes, experts believe that "behind the Greek influence that shaped the Hellenistic Pisidian communities there lay a tangible and important Anatolian tradition." According to the writings of Arrian the population of Side, who traced their origins to Aeolian Cyme, had forgotten the Greek language by the time Alexander arrived at the city in 334 BC. There are coins and stone inscriptions that attest to a unique script from the region but the language has only been partially deciphered. The latest dateable coins found at the Phrygian capital of Gordion are from the 2nd century BC. Finds from the abandoned Hellenistic era settlement include imported and locally produced imitation Greek-style terracotta figurines and ceramics. Inscriptions show that some of the inhabitants had Greek names, while others had Anatolian or possibly Celtic names. Many Phrygian cult objects were Hellenized during the Hellenistic period, but worship of traditional deities like the Phrygian mother goddess persisted. Greek cults attested to include Hermes, Kybele, the Muses and Tyche. Greek art and culture reached Phoenicia by way of commerce before any Greek cities were founded in Syria. but Hellenization of Syrians in not widespread until it becomes a Roman province . 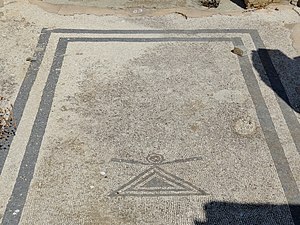 Under Roman rule in the 1st century BC there is evidence of Hellenistic style funerary architecture, decorative elements, mythological references, and inscriptions. However, there is a lack of evidence from Hellenistic Syria; concerning this most scholars view it as a case of "absence of evidence is not evidence of absence". The Bactrians, an Iranian ethnic group who lived in Bactria (northern Afghanistan), were Hellenized during the reign of the Greco-Bactrian Kingdom and soon after various tribes in northwestern regions of the Indian subcontinent underwent Hellenization during the reign of the Indo-Greek Kingdom. The periodization of the Hellenistic Age, between the conquests of Alexander the Great up to Octavian's victory at the Battle of Actium, has been attributed to the 19th-century historian J. G. Droysen. According to this model the spread of Greek culture spread during this period made the rise of Christianity possible. Later, in the 20th century, scholars questioned this 19th-century paradigm for failing to account for the contributions of Semitic and other Near Eastern cultures. The twentieth century witnessed a lively debate over the extent of Hellenization in the Levant, particularly among the ancient Jews, which has continued until today. Interpretations on the rise of Early Christianity, which was applied most famously by Rudolf Bultmann, used to see Judaism as largely unaffected by Hellenism, and the Judaism of the diaspora was thought to have succumbed thoroughly to its influences. Bultmann thus argued that Christianity arose almost completely within those Hellenistic confines and should be read against that background, as opposed to a more traditional Jewish background. With the publication of Martin Hengel's two-volume study Hellenism and Judaism (1974, German original 1972) and subsequent studies Jews, Greeks and Barbarians: Aspects of the Hellenisation of Judaism in the pre-Christian Period (1980, German original 1976) and The 'Hellenisation' of Judaea in the First Century after Christ (1989, German original 1989), the tide began to turn decisively. Hengel argued that virtually all of Judaism was highly Hellenized well before the beginning of the Christian era, and even the Greek language was well known throughout the cities and even the smaller towns of Jewish Palestine. Scholars have continued to nuance Hengel's views, but almost all believe that strong Hellenistic influences were throughout the Levant, even among the conservative Jewish communities, which were the most nationalistic. Again in the doctrine of the Trinity, the ecclesiastical conception of Father, Word, and Spirit finds its germ in the different Stoic names of the Divine Unity. Thus Seneca, writing of the supreme Power which shapes the universe, states, 'This Power we sometimes call the All-ruling God, sometimes the incorporeal Wisdom, sometimes the holy Spirit, sometimes Destiny.' The Church had only to reject the last of these terms to arrive at its own acceptable definition of the Divine Nature; while the further assertion 'these three are One', which the modern mind finds paradoxical, was no more than commonplace to those familiar with Stoic notions. The Greek East was one of the two main cultural areas of the Roman Empire and began to be ruled by an autonomous imperial court in 286 AD under Diocletian. However, Rome remained the nominal capital of both parts of the empire and Latin was the state language. When the Roman Senate sent the regalia of the Western Emperor to the Eastern Emperor Zeno in 476 AD, Constantinople (Byzantium in Ancient Greek) was recognized as the seat of the sole Emperor. A process of political Hellenization began and led, among other reforms, to the declaration of Greek as the official language in 610 AD. ^ a b c Zacharia 2008, p. 232. ^ a b Koliopoulos & Veremis 2002, pp. 232–241. ^ Graninger, Charles Denver (18 July 2018). "New Contexts for the Seuthopolis Inscription (IGBulg 3.2 1731)". Klio. 100 (1): 178–194. doi:10.1515/klio-2018-0006. Retrieved 29 July 2018. ^ Nankov, Emil. "Beyond Hellenization: Reconsidering Greek Literacy in the Thracian City of Seuthopolis". Retrieved 29 July 2018. ^ Boyce & Grenet 1975, p. 353: "South Syria was thus a comparatively late addition to the Seleucid empire, whose heartland was North Syria. Here Seleucus himself created four cities—his capital of Antiochia-on-the-Orontes, and Apamea, Seleucia and Laodicia—all new foundations with a European citizen body. Twelve other Hellenistic cities are known there, and the Seleucid army was largely based in this region, either garrisoning its towns or settled as reservists in military colonies. Hellenisation, although intensive, seems in the main to have been confined to these urban centers, where Greek was commonly spoken. The country people appear to have been little affected by the cultural change, and continued to speak Syriac and to follow their traditional ways. Despite its political importance, little is known of Syria under Macedonian rule, and even the process of Hellenisation is mainly to be traced in the one community which has preserved some records from this time, namely the Jews of South Syria." ^ "DENYING ETHNIC IDENTITY – The Macedonians of Greece" (PDF). Human Rights Watch/Helsinki. 1994. ISBN 978-1-56432-132-9. ^ Giulio 2000, p. 132. ^ a b Stoneman, Richard (2011). "6. The Oracle Coast: Sibyls and Prophets of Asia Minor". The Ancient Oracles: Making the Gods Speak. Yale University Press. pp. 77–103. ISBN 978-0-300-14042-2. ^ a b Kealhofer, Lisa (1 January 2011). The Archaeology of Midas and the Phrygians: Recent Work At Gordion. University of Pennsylvania Press. ISBN 978-1-934536-24-7. ^ de Jong, Lidewijde (1 July 2007). Narratives of Roman Syria: A Historiography of Syria as a Province of Rome. Rochester, NY: Social Science Research Network. Retrieved 29 July 2018. ^ Aurelius, Marcus (1964). Meditations. London: Penguin Books. p. 25. ISBN 978-0-140-44140-6. Athanassakis, Apostolos N. (1977). "N.G.L. Hammond, Migrations and Invasions in Greece and Adjacent Areas (review)". American Journal of Philology. 99 (2): 263–266. doi:10.2307/293653. JSTOR 293653. Boardman, John; Hammond, N. G. L. (1982). The Cambridge Ancient History Volume 3, Part 3: The Expansion of the Greek World, Eighth to Sixth Centuries BC. Cambridge University Press. ISBN 978-0-521-23447-4. Boyce, Mary; Grenet, Frantz (1975). A History of Zoroastrianism, Vol. 3: Zoroastrianism under Macedonian and Roman Rule. Brill. ISBN 978-90-04-09271-6. Daskalov, Roumen; Vezenkov, Alexander (13 March 2015). Entangled Histories of the Balkans - Volume Three: Shared Pasts, Disputed Legacies. Brill. ISBN 978-90-04-29036-5. Giulio, Vignoli (2000). Gli Italiani Dimenticati: Minoranze Italiane In Europa (Saggi e Interventi) (in Italian). Milan: A. Giuffrè Editore. ISBN 978-8-81-408145-3. Hammond, Nicholas Geoffrey Lemprière (1976). Migrations and Invasions in Greece and Adjacent Areas. Noyes Press. ISBN 978-0-8155-5047-1. Hornblower, Simon (1991). A Commentary on Thucydides: Volume II: Books IV-V. 24. OUP Oxford. ISBN 978-0-19-927625-7. Hornblower, Simon (2014). "Hellenism, Hellenization". The Oxford Companion to Classical Civilization. Oxford University Press. ISBN 978-0-19-870677-9. Isaac, Benjamin H. (2004). The Invention of Racism in Classical Antiquity. Princeton University Press. ISBN 978-0-691-12598-5. Jones, A. H. M. (1940). The Greek City From Alexander To Justinian. Retrieved 29 July 2018. Jong, Lidewijde de (2017). The Archaeology of Death in Roman Syria: Burial, Commemoration, and Empire. Cambridge University Press. ISBN 978-1-108-21072-0. Koliopoulos, John S.; Veremis, Thanos M. (2002). Greece: The Modern Sequel: From 1831 to the Present. New York University Press. ISBN 978-0-8147-4767-4. Lewis, D. M.; Boardman, John (1994). The Cambridge Ancient History, Volume 6: The Fourth Century B.C. Cambridge University Press. ISBN 978-0-521-23348-4. Martin, Dale B. (24 April 2012). "4. Ancient Judaism". New Testament History and Literature. Yale University Press. pp. 55–66. ISBN 978-0-300-18219-4. Mitchell, Stephen (1991). "The Hellenization of Pisidia": 119–145. Mitchell, Stephen (1993). Anatolia: Land, Men, and Gods in Asia Minor. Clarendon Press. Mitchell, Stephen; Vandeput, Lutgarde (2013). "Sagalassos and the Pisidia Survey Project: In Search of Pisidia's History": 97–118. Patterson, Lee E. (15 December 2010). Kinship Myth in Ancient Greece. University of Texas Press. ISBN 978-0-292-73959-8. Pomeroy, Sarah B.; Burstein, Stanley M.; Donlan, Walter; Roberts, Jennifer Tolbert (2008). A Brief History of Ancient Greece: Politics, Society, and Culture. Oxford University Press. ISBN 978-0-19-537235-9. Roller, Lynn E. (2011). "Phrygian and the Phrygians". The Oxford Handbook of Ancient Anatolia. 1. doi:10.1093/oxfordhb/9780195376142.013.0025. Retrieved 29 July 2018. Shimoff, Sandra R. (1996). "Banquets: the Limits of Hellenization". Journal for the Study of Judaism. 27 (4): 440–452. doi:10.1163/157006396X00166. Tsetskhladze, Gocha R. (2010). "Bosporus, Kingdom of". The Oxford Encyclopedia of Ancient Greece and Rome. Oxford University Press. ISBN 978-0-19-517072-6. Retrieved 29 July 2018. Webber, Christopher; McBride, Angus (2001). The Thracians, 700 BC – AD 46. Osprey Publishing. ISBN 978-1-84176-329-3. Wilson, Nigel (31 October 2013). Encyclopedia of Ancient Greece. Routledge. ISBN 978-1-136-78800-0. Zacharia, Katerina (2008). Hellenisms: Culture, Identity, and Ethnicity from Antiquity to Modernity. Ashgate Publishing, Limited. ISBN 978-0-7546-6525-0. Goldhill, Simon (2002). Who Needs Greek? Contests in the Cultural History of Hellenism. Cambridge, United Kingdom: Cambridge University Press. ISBN 978-0-521-01176-1.